The WSU Legal Studies Professional Option is one of the relatively few American Bar Association (ABA)-approved four-year Legal Studies Professional Options in the nation. It was the first in the state of Minnesota to be ABA approved. The Program is subject to an ABA on-site re-evaluation every seven years. The Legal Studies Professional Option enables students to develop both intellectual and professional skills in the law. The Professional Option is designed to meet the needs of students wishing to enter into a career that demands knowledge and experience with legal systems and institutions. Legal Studies graduates work with lawyers, but do not offer or give legal advice on their own. The degree also serves as excellent preparation for law school. The interdisciplinary foundations courses in the major are taught by WSU faculty, while the Legal Studies specialty sequence courses are largely taught by practicing lawyers and paralegals. The program has a long tradition of drawing on practical expertise from the surrounding community, contributing positively to the overall student experience and networking opportunities. The bachelor of science (B.S.) Legal Studies degree is a four-year undergraduate degree. The degree combines a strong emphasis of Liberal Arts skills with legal specialty courses. 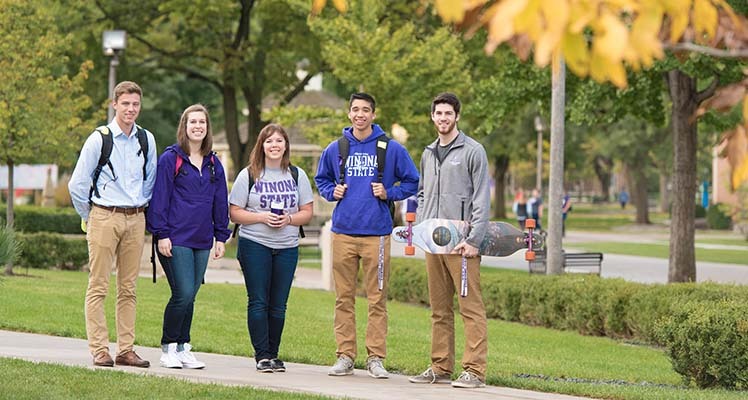 The first two years consist of completing courses in WSU’s general education requirements, along with foundation courses in history and political science. Students generally begin the specialty sequence during the fall of their junior year, culminating in a one-semester internship experience. A Major Map (PDF) is available to help students plan to complete their major coursework in four years. Additionally, the WSU course catalog provides a full description of all required paralegal courses. The Legal Studies Minor serves to enable students to develop both intellectual and professional skills in the law while making important connections between their current major and the law. The Legal Studies Minor is not ABA approved. As one of the central forces, processes and institutions in modern life, the law (in all its guises) merits the liberal-arts-based examination offered by the Law and Society Option. This is a richly interdisciplinary major that enables interested students to study law and legal culture from many disciplinary, conceptual, historical, theoretical and empirical perspectives. A Major Map (PDF) is available to help students plan to complete their major coursework in four years. Additionally, the WSU course catalog provides a full description of all required law and society courses. A number of Law and Society majors go on to law school. Law school, however, is not the only option. Increasingly, employers are looking for students well versed in multiple-disciplines and the Law and Society major at WSU allows students to practice a set of skills employers are looking for in the 21st century. Any career that rewards clear thinking, good writing, articulate speaking and the ability to ask and decipher complicated questions will be open to a well-trained Law and Society major. WSU Law and Society graduates have found employment in careers ranging from law enforcement to sales and marketing. The Law and Society B.A. Degree is not ABA approved. Students wishing to attend Mitchell Hamline School of Law can select this major. Upon completion of three years of work at WSU, students, upon successful admission to the Mitchell Hamline School of Law, can forego their final year of work at WSU. Their first year course curriculum at MHSL will count toward the completion of a BS from Winona State University. Thus, successful students would receive a BS from WSU and a JD from Mitchell Hamline in six years instead of seven. Interested students should speak to the Director of Legal Studies early in their WSU career and apply for admission to the 3+3 Program. View the Major Map (PDF) for more information.